Scanian folk songs, Celtic harp and Jämtlandish fiddle: Vindonia sprung out of pure joy of making music, and a preference for songs of desire and despair, playful tunes and melodies to lift body and mind. Their music brings us on new pathways to a landscape rich with contrast an nuance. 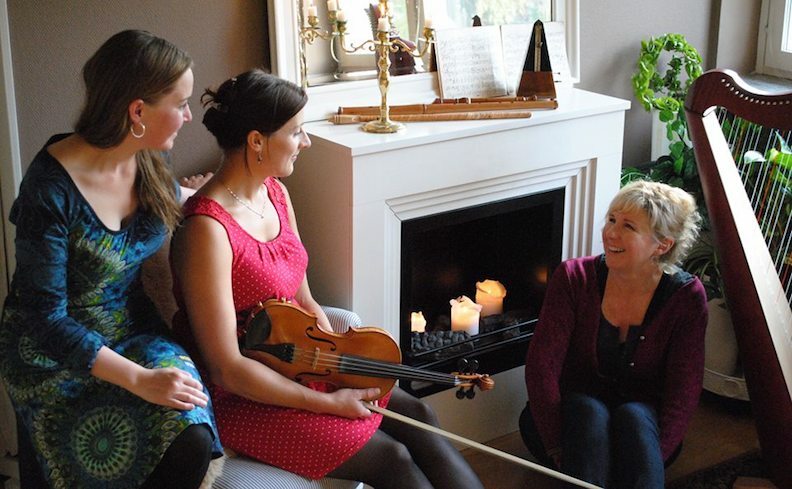 Vindonia plays Nordic traditional tunes in a personal style, featuring Lise Enochsson, Scanian folk singing; Karin Blom, Jämtland fiddling, and Susan Syverson on the Celtic harp. Lise Enochsson has been singing and performing since childhood. With the Scanian folk singing she has performed at festivals and on tours in Europe and in the US. She studied traditional singing at Malungs Folkhögskola and currently is co-leader of Skånska Kören in Lund. Karin Blom has her roots in the Jämtlandish music and as a child she learned to play the fiddle from local traditional fiddlers. She studied Traditional Music and Pedagogy at Malungs Folkhögskola. Karin also plays Irish trad music, pop and is active in different singer- songwriter-constellations. Susan Syverson is a classically trained musician with a lifelong preference for folk music. An established freelance musican, harp tutor at Kulturskolan i Kristianstad and an ambassador for the harp in Scandinavia. Susan is originally from the US (SD), and apart from living in Sweden she has lived and worked in Tanzania, and worked in Ireland and Scotland.